Ah, back in the saddle. Traveling is great, meeting you all is great, but it’s such a good feeling to be catching up again. Oh, and if you want to order one? Book #2 should be available at the TopatoCo store in the next week or two! Also, while in Toronto, I hung out with Don (of Road Apples Almanac) and Brian, and one night for a writing/drawing/goofing-off exercise/game/diversion we drew three comics, each writing and drawing one panel of each. Don posted them over on his site (below the comic in the blog). And also also also Jason Clarke did an awesome re-draw of the book #2 cover. Drew Struzan eat your heart out! 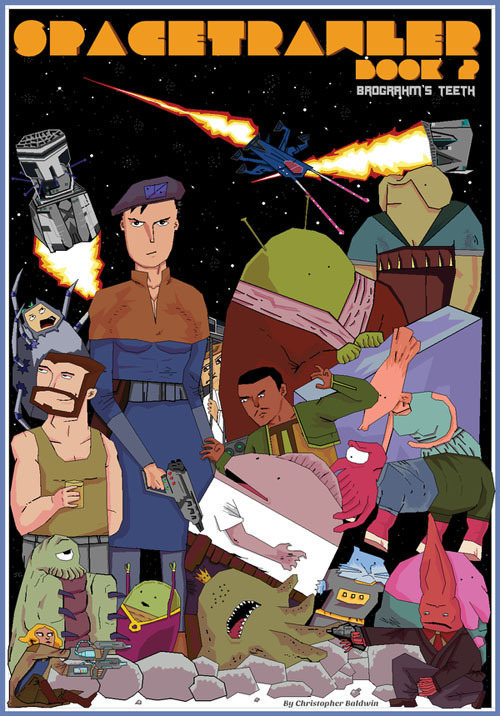 You can also find this picture along with other guest art pieces on the Spacetrawler “fan art” page. I’m sure Interplanet Amity must have been hoping against hope that Rickshaw would return and lead them to victory. It figures that he would show up NOW of all times, and just turn things into even more of a clusterfrag. Huh. I didn’t recognize Emily at first. Oh, great – “Armada of pure fury” is NOT likely to be pointed in the right direction, is it? @Ronald: Here’s the thing about Checkhov’s gun: there may very well be a gun, but unless the author makes you focus your attention on it, even if it’s only for a split-second, it probably isn’t a Checkhov’s gun. Yep. Been wondering for a long time when (and under what circumstances) Rickshaw would show up again. I did not figure on him coming back in such a potentially complicating way. Nice twist! Why do I get the feeling that Dimitri and Rikshaw will get along famously? Rikshaw will act like he’s leading the movement, and Dimitri will help Rikshaw maintain his belief system while Dimitri is actually getting things done in the proper way. All without spilling a drop. The climactic battle took place in a field of sunflowers. All the survivors agreed that the day was sparkling and the field was beautiful. Then the two armies set their tanks in motion and charged at each other through the sunflowers. The sunflowers were so tall and the field so thick that you had German and Soviet tanks pass within a meter of each other without realizing it, until they’d reached the other side of the field and had to turn around. I’m really astounded, actually. why would they do that? why not just give him a regular greased light speed drive?? ?